Yes they are all tropical fruit but that is not why they are on the list..... A study looked at how artifice ripening affected their vitamin C levels. 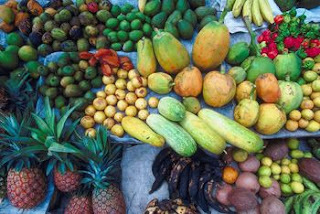 One of the reasons for the study is that tropical fruit, like most other fruit, is picked unripe. Then they are artificially ripened. This is done to (1) allow fruit to be exported/travel long distances without going off and (2) when picked unripe they don't bruise as quickly, so they are not damaged by the machinary / people involved in the picking, sorting and travel processes. "there is a remarkable loss of AA content (usually 30–40%) after the one-week period of artificial ripening, in all the different tropical fruits considered"
I find this very disturbing, firstly that this study was only done in 1995. Secondly it was across all the fruit studied, indicating that it is highly probably that most tropical fruit follow this trend. And lastly these types of tropical fruit are available, and hence purchased, in our local supermarket.